Today, HRC announced a partnership with Presente -- Peru’s largest LGBT advocacy group -- to promote LGBT inclusion across workplaces in Peru. 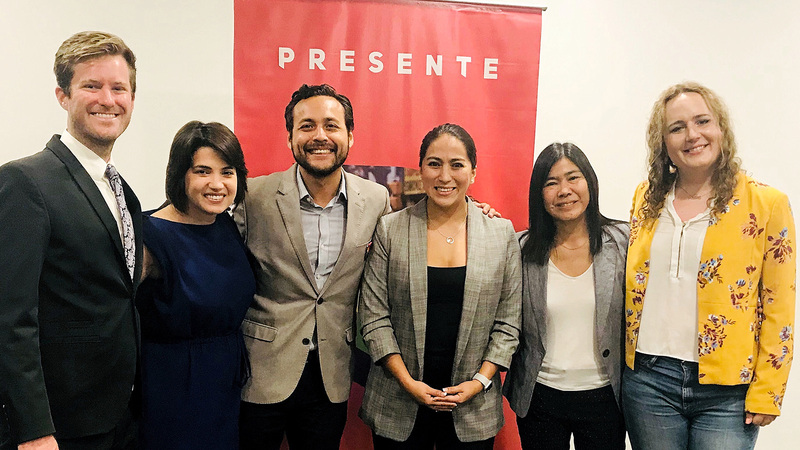 HRC joined Presente and corporate partners in Lima to honor for the first time major employers, including American Airlines, Atento, Scotiabank, WeWork and Techo Perú, for their growing commitment to greater LGBT equality and inclusion for workers across the country. At the event, the Lima-based organization Presente released the findings of Diagnóstico de Diversidad y Equidad, its recent survey evaluating LGBT-inclusion in more than 50 businesses and multinationals, using HRC’s Spanish-language business toolkit to assess policies and practices. The five companies honored earned top ratings in the inaugural report, receiving Presente’s seal of recognition for their leadership in furthering LGBT-inclusive practices, and ongoing commitment to foster welcoming working environments for all employees. Deena Fidas, director of the HRC Foundation’s Workplace Equality Program and co-author of HRC’s annual Corporate Equality Index (CEI) -- the premier benchmarking tool for corporate LGBTQ-inclusive policies in the U.S. -- delivered opening remarks. She highlighted the success of HRC’s two in-country programs that are already driving positive change in Mexico and Chile, where HRC is working with major employers to advance LGBT-inclusive practices in workplaces across the region. As a proud HRC Global Innovator, de la Cruz Soler participated in HRC’s 2017 Innovative Advocacy Summit in Washington, D.C., where he joined 30 LGBTQ leaders and advocates from 28 countries and HRC Global experts to learn new methods to advance LGBT equality around the world. Since then, de la Cruz Soler has helped drive a national dialogue about LGBT equality and workplace inclusion in Peru, while leading efforts to establish Presente as the preeminent LGBT organization in Peru for cultural associations and businesses seeking to advance LGBT inclusion. As part of the visit, HRC Global will be convening an international group of LGBTQ activists for a Latin American and the Caribbean Regional Workshop, a two-day event focusing on the opportunities and challenges of advancing LGBT inclusion in the region. The forum will bring together LGBTQ advocates from Argentina, Belize, Brazil, Colombia, Ecuador, Jamaica and Peru to explore HRC’s new resource, Engaging Employers in Advancing Equality, and share strategic methods to engage businesses and allies in the global equality movement. Through its global workplace equality programs HRC Equidad MX and HRC Equidad CL, the HRC Foundation is leading efforts to advance LGBT workplace inclusion in workplaces across the U.S., Mexico and Chile, potentially impacting more than 14.5 million employees worldwide. HRC is proud to partner with Presente in its continuing efforts to promote diversity and LGBT workplace inclusion across Latin America. For more information on HRC global programs, please visit hrc.im/GlobalWorkplacePrograms and hrc.org/global.